Nice surprise first this morning with my cup of coffee reading about this new pen!! Looks like another order gonna be made here real soon! 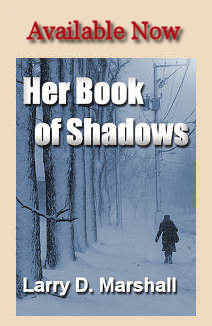 Thank you for the write-up. 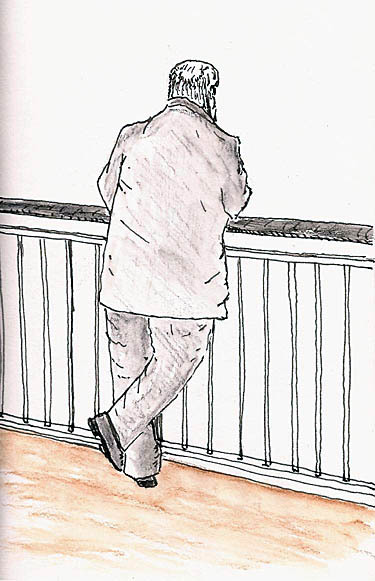 And great sketch!! It’s hard to go too far wrong over a $15 pen but this one is definitely a winner. It’s not as fine as I typically like but for many it’s as fine as they’d ever use. And it sure is well-made. 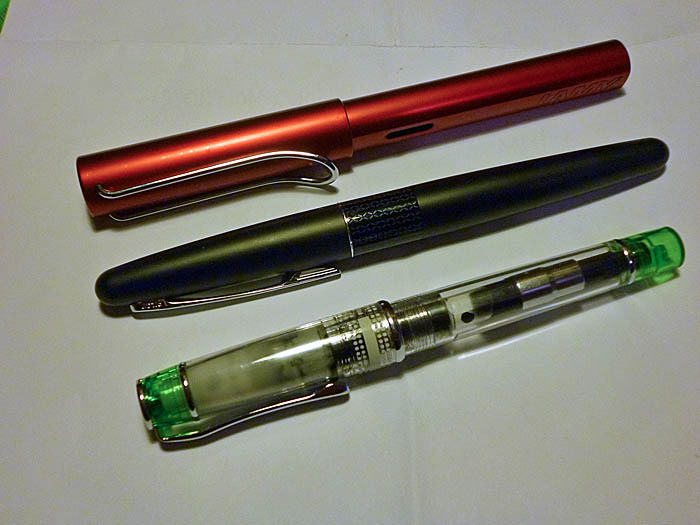 I’ll probably add the CON-50 to mine and that will make it a $20 pen but still pretty cheap. Thanks for the info, Larry. Its always interesting to have reports on other pens and stores. As you say, Goulets is a great online store. They also have an extremely interesting website full of useful tips. My only hesitation in purchasing from them is the delivery charges. I guess its not their fault; its the way the US postal system works. In my experience, a $15 pen would cost around $9 in delivery. True, there’s no tax, but it makes you hesitate or consider a larger order. …really, those shipping costs are more dependent upon energy costs than anything else, Michael, which is why they’ve risen so much in recent years. 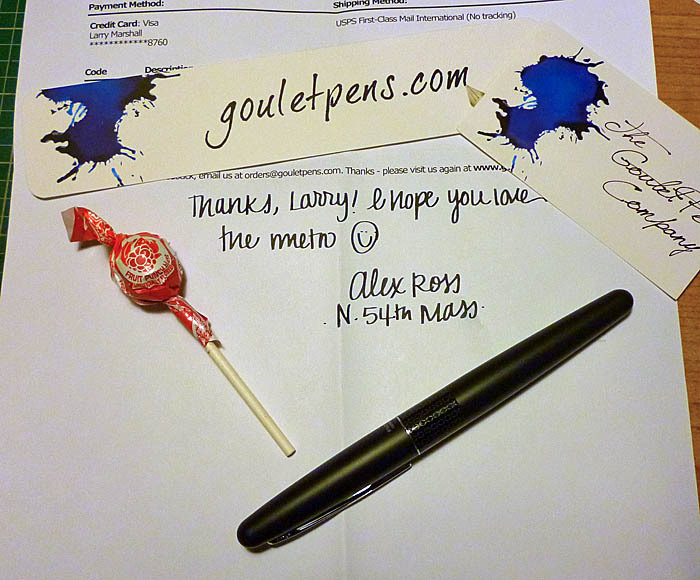 That said, Goulet Pens, and Jet Pens, see far more reasonable in how they ship than most companies. 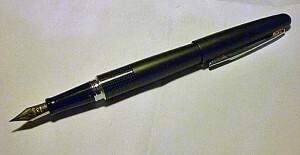 Your view that a $15 pen costing $9 to ship causes you to hesitate to consider a larger order is interesting. My view, for several decades of ordering from the US, is exactly the opposite. I rarely order just one thing because of the shipping costs. But the thing is, if you add a bottle of Noodler’s ink ($12.50) to that $15 pen, you’ll still only pay $9 to ship it, and the shipping costs are thus smaller relative to the purchase price. That aside, maybe you have great local sources for stuff. I don’t. I can buy that bottle of Noodler’s ink, as long as I’m willing to pay $17 for it and willing to wait for it to be special ordered for me. I can buy the $15 pen as long as I’m willing to pay $30 for it. So, that bottle of ink and pen, even with $9 shipping, starts looking pretty darn good to me (grin). But truth is, most of the time, the stuff I want is simply not available to me unless I’m willing to order from one of the pen companies. 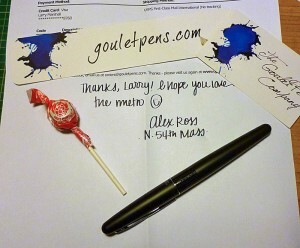 Agree completely about Goulet Pens service! They’re terrific! FYI…Alex is a she, not a he, and unfortunately, she’s left the company. Thanks, Stan. I had heard that Alex had left the company. Didn’t know that he was a she (grin).